I am back! And today I'm going to talk about the importance of volleying when your opponent is in the front of the court. This is generally much more difficult than volleying when your opponent is behind you as you have less time to react. When your opponent is up at the front of the court there are a lot of factors that will determine if you will be able to volley their shot or not. First let's discuss why this is such an important strategy to employ. 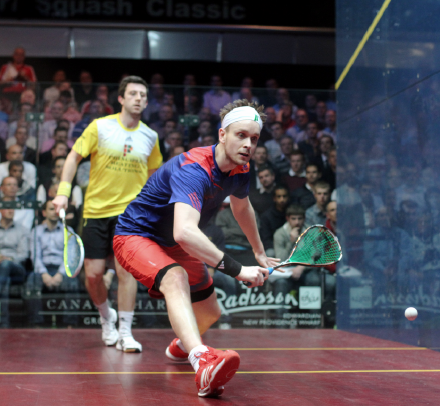 As you improve in squash you get to a level where attacking shots to the front of the court are not often outright winners. Instead these attacking shots create pressure and this is where you should be looking to trap your opponent in the front of the court and follow up your attack with a volley. If you do and can hit a decent volley length you have a great shot at winning the point or at the very least keeping your opponent on the run. Above you can see a picture of Mosaad hitting a backhand straight drive from the front. You can see Ramy hasn't left the T yet so Mosaad must have disguised his shot well. 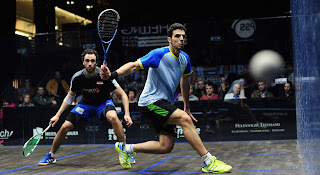 If Mosaad had not, Ramy would be right behind him hunting the volley. Ramy does have cat like reflexes so it is entirely possibly that he was still able to cut this ball off, but I would guess this is going to get by him if it was hit with enough pace. Hopefully you can now have a better understanding as to why volleying when your opponent is in the front of the court creates so many problems. If you want to try to implement this into your game here are some things that will help you do so. I believe there are a couple of essential things to being able to volley when your opponent is in front of you. The first is the ability to read your opponent and anticipate where they are going to hit. As someone is under more pressure they will be less likely to disguise their shot and are more vulnerable to you jumping on the volley behind them. This leads to the second essential factor, pressure. If you put your opponent under pressure as you bring them to the from you are more likely to get a weak reply and will make your volley far easier. 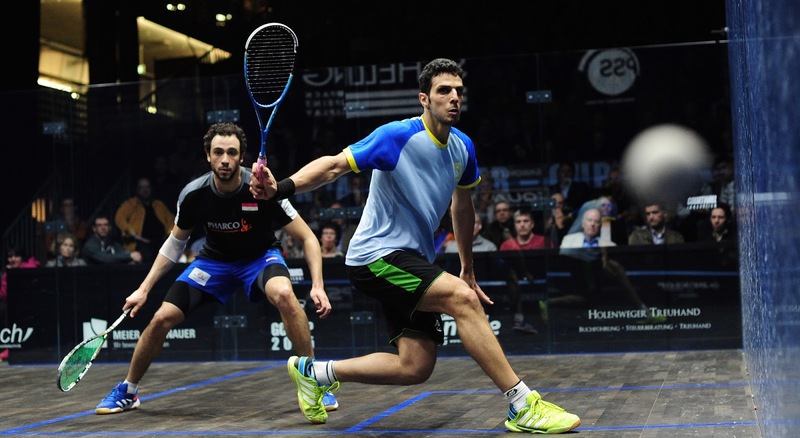 A third factor that will allow you to volley more around the middle is quick feet and good footwork moving laterally. This includes being able to hit open stance and having a quick racquet preparation. You also need to be able to hit a good snappy volley with a compact backswing. To hit a short snappy volley with accuracy you need to time it perfectly. This is again why putting your opponent under pressure and being able to read their postural set up is so key to early preparation. You can even adjust your T position up or sideways when the situation dictates. If you move up and take the ball even earlier you give your opponent even less time to get the next shot. Key Note: If your opponent is under little pressure and disguises their shot or has good holds you will need to make sure your attacking shot is more accurate if you want to implement this tactic. Here are some of my favourite drills, condition games and exercises for working on volleying the ball while your opponent is in the front of the court. 8) 3 corner court while I attempt to not let any balls being hit from the front get into the back corner. 9) Quick mid-court volleys in pairs side to side. This is a great exercise for getting on your toes, having your racquet up while learning to react quickly to the ball. 10) Work on your lateral court movement. Try 1 person posting to either side or shadow ghosting a partner to make this movement more challenging and specific. Be sure to shape up with your racquet quickly while ghosting to prepare yourself properly. 11) Learn to hit open stance volleys with some snap on them. Try doing solo mid-court volley drives on your back foot. Most people can generate adequate pace when they have time, but when you have to shorten your backswing can you still generate enough pop to execute the desired result? Many people are aware that especially from the front of the court on their forehand side most people have a tendency to hit the ball crosscourt. If you pick up on this shot pattern try and take advantage of it and cut the ball off. This is why you see the pros play many shots down the middle and extra wide crosscourts. They've played so much squash and have to use the entire court height and width to get their opponent of the volley. Learning to bring your opponent to the front and then follow it with a volley is what I like to call a shot combination. Try and see if you can find one that will work and if they don't adjust keep taking advantage of their predictability or lack of precision. This post could be written entirely backwards about how to keep your opponent off the volley when you are at the front. If you practice some of the drills above you will also be learning how to do this. This is why there isn't always a set perfect width; because this depends on your and your opponents court position. But I digress. That's enough. I know it's been awhile since my last post, so I hope this was interesting and worth the wait! Remember that taking the ball early increase your area to attack and decreases the time allowed for your opponent. The less time you allow your opponent the weaker their response will be.